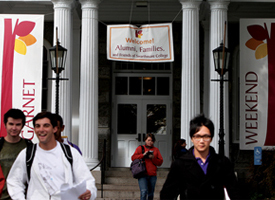 More than 600 courses are listed in the Swarthmore College catalog. Not all are taught each year, but, taken as a whole, the College’s curriculum offers its 1,500 students a stunning array of learning opportunities in the social sciences, natural sciences, and humanities—plus a dozen interdisciplinary minors. 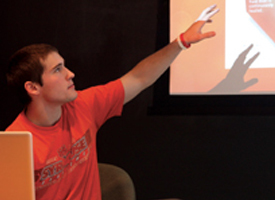 Thirty-five departments and programs make Swarthmore’s curriculum both broad and deep. 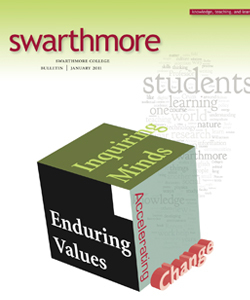 What courses will Swarthmore’s catalog contain in 2021? Will ancient texts still be discussed around tables of 12? How will curricular innovation be married with tried-and-true pedagogies? Will there be more problem-based courses like Associate Professor of Political Science Keith Reeves’s [’88] honors seminar The Urban Underclass and Public Policy? More opportunities to cross disciplinary boundaries as in Professor of Physics Michael Brown’s first-year seminar on energy? Or greater use of technology and media in courses like Professor of English Literature Betsy Bolton’s Writing Nature: Digital Storytelling? Professor Michael Brown's explanation of why the Earth is the temperature it is. Clear, crisp, colorful, congenial—all are words that describe the three days in October when more than 1,000 alumni, parents, friends, faculty, and staff convened on campus for Swarthmore’s first-ever Garnet Homecoming and Family Weekend. Outside, beneath brilliant blue skies and autumnal trees, groups gathered together to take tours of the Crum, follow Friends Historical Library Curator Christopher Densmore around the campus to learn about the College’s connections to the Underground Railroad, or see gems of the Scott Arboretum revealed. 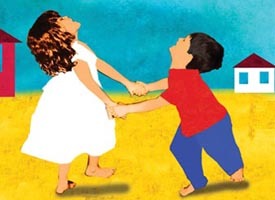 One need not look too hard to find Adele Diamond dancing, but it has to be a certain kind of dance—a subtle combination of social, rule-based, and interactive. “I hate the way ballroom dancing is taught in dancing schools,” says Diamond. “They teach that you’re supposed to look over your partner’s shoulder. I don’t want to dance with somebody who’s looking over my shoulder. I want the interaction…. “Salsa, swing, tango, contradance from New England, hambo from Sweden,” she says, listing some of her favorites. In my second year of grad school, the river ran dry. With a degree in ancient Greek and no clear plans for life after Swarthmore, I’d been relieved when the University of Pennsylvania offered me a fellowship for their doctoral program in classical studies. Because I enjoyed studying the languages, history, and literature of the ancient world, it had seemed like a good idea at the time. But after a year or so it became clear to me that I simply didn’t have the drive to become a professional scholar and deep down I didn’t understand the ways of academia. I left Penn with a master’s degree, but in my heart I knew I was a dropout. One day in the early 1990s, while out playing with her two young daughters in Triangle Park in Rutledge, Pa., Diane Anderson, then a K–12 curriculum director in New Jersey schools, chatted with a man who was also in the park with his child. Anderson—now an associate professor of educational studies—made a deep enough impression upon the man that he spoke of her to his wife, Anne Renninger, who is a Swarthmore professor of educational studies. Later, Renninger met up with Anderson and eventually invited her to take on the part-time job of supervising the department’s student teachers. It’s easy to become cynical when talking about long-range planning. You ask a lot of earnest questions and gather guarded, self-interested answers that range from the sublime to the ridiculous. You write it all up in a study that’s out of date the moment it’s completed. Then you put it on the shelf and go about your business. As a boy growing up in Accra, Ghana, Tralance Addy ’69 walked to the nearby public faucet each morning with his siblings to obtain water for the family’s cooking and cleansing needs. Today, Addy lives in Trabuco Canyon, Calif., and, by phone, in a resonating baritone voice, he speaks passionately about his mission to bring potable water to developing countries, where contaminated water is a major public health problem.